I just love coffee shops. When I moved to college, it was clear I’d have to get creative in order to get some alone time. Thus started my love with coffee shop scouting! There’s just something so soothing about sitting in a cafe with calm music that instantly relaxes me. But my #1 rule has always been to not bind myself to a single cafe but have a few for different purposes. The Study Shop: Look for great wifi, late hours, outlets (so important) and some seriously good caffeine. What else is going to write that final paper? Ideally this shop isn’t as popular, so you can rock those sweats and not have to worry about seeing anyone. The Date, Hangout Shop: Look for board games, good food, and good, mellow music. This shop is filled with young people, but is very relaxing in nature. Bonus: they have great pastries. 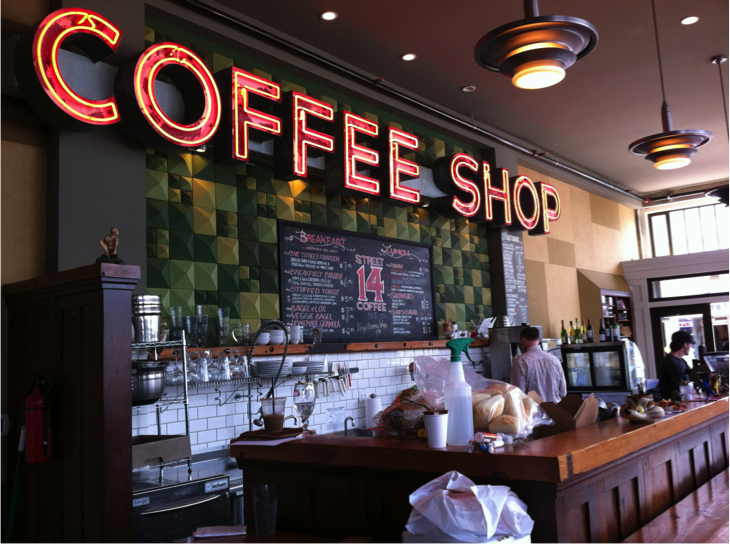 Going out Coffee Shop: Try to find a chic, modern shop for this category. It’s the kind of place that trades its baristas for bartenders at night. The energy is always contagious. Bonus: they serve good dinner and lunch.